Teeth implants have the reputation of being incredibly pricey because in developed nations they can cost a small fortune. Dental implants in some other parts of the globe, however, are much more affordable. Canadians and Americans have a lot to gain from rising dental tourism in Mexico.The cost of teeth implants in Tijuana, Mexico, for example, is something that can fit within your budget compared to the cost of the procedure in the first-world nations. And if you’re from the other side of the globe, you have other options such as getting Straumann Teeth Implants in India or Zimmer Teeth Implants in Thailand. Dentures are a good solution to replacing missing teeth, but they can never fool anyone into thinking they’re real teeth. Sometimes, they even have the tendency to slip out, and humiliate you in public. While they serve their purpose, there’s something else that can do so better — dental implants. Dental implants are very sturdy, and a study called Comparison of dental implant systems: quality of clinical evidence and prediction of 5-year survival by Eckert SE, Choi YG, Sanchez AR, and Koka S. published in the International Journal of Oral and Maxillofacial Implants in the May-June 2005 edition shows most types of teeth implants exceed the five-year survival rate imposed by the American Dental Association. Tijuana is one of the wealthiest cities in Mexico, and maintains a global city status. With its growing medical tourism industry you can find facilities and dentists that can provide you with the best dental work. Any rules you might follow in another country, you have to follow during your dental trip to Mexico. For example, according to the Association of Dental Implantology UK, most dentists would want to place a minimum of six implants in your upper jaw if you have no teeth anymore. Dental implant prices in Tijuana are much lower relative to the prices in first world nations. The more affordable materials and the lower cost of living in Mexico allow the medical tourism industry of the country to offer procedures at a more affordable price. Even the best dentist in the Mexican border town will offer prices that you can afford, and the hospitals can offer top-notch service for a fraction of the cost. Keep in mind, however, that the exact cost of a dental implant depends on many factors such as the hospital and the doctor that attend to you and the number of implants you get. 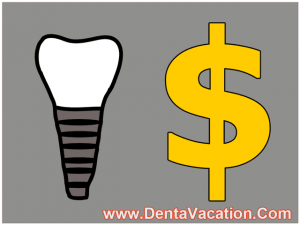 Dental implant prices are relatively lower than in the USA all over Mexico. If you don’t think the Mexican border town is the right place for you, consider other locations that offer affordable dental work. The low teeth implant costs in Mexico do not equate to low quality work. Do your research about the booming medical tourism industry in the country, and find great doctors, dentists, clinics, and hospitals. The affordable dental prices might enable you to go on a holiday after your procedure. Traveling to Mexico for teeth implants can be doubled up for leisurely sightseeing. Don’t forget, however, that should complications arise, it won’t be easy getting back to the dentist who attended on you during your stay in Tijuana – always have contacts back home, even if you are confident about getting teeth implants in away from home. If the low cost of dental implants in Tijuana, Mexico has convinced you to get your procedure done there, visit your nearest Mexican embassy to inquire about the documents you need to get into the country. The affordable cost of teeth implants could be just what you’re looking for to bring back some of your old confidence and flair. Sure, going to another country isn’t an easy decision to make, especially when you intend to undergo a medical procedure. 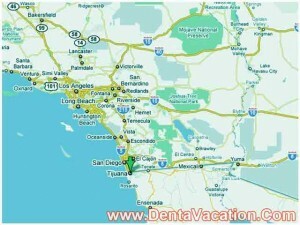 It is recommended that patients carefully choose the dentist and hospital for getting dental implants in Tijuana. Research well on the Internet and appraise dentists on the basis of innumerable patients’ feedback available on the Web. DentaVacation facilitates affordable dental treatments at various destinations across the world. For more information, submit the estimate-request form on the right.